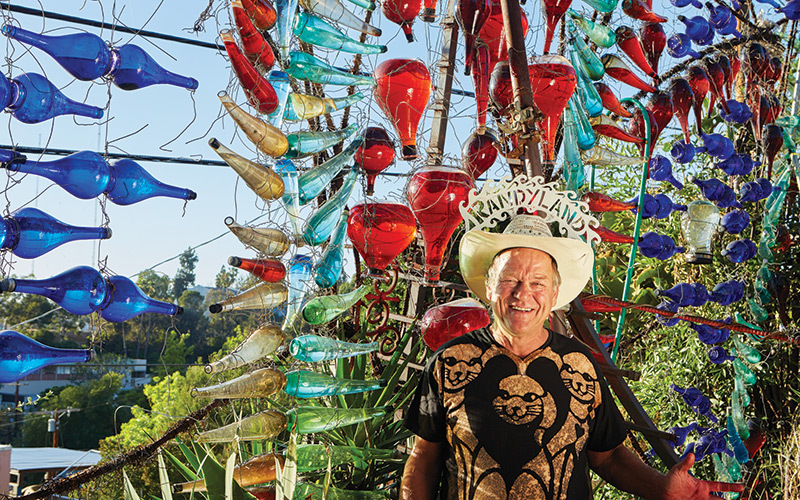 “It” is Phantasma Gloria, a glittering, homespun installation circling Lawrence’s property, which he affectionately calls Randyland. L.A. is crammed with folk art if you know where to look—Venice’s Mosaic Tile House and Hollywood’s Garden of Oz are just two masterpieces hiding in plain sight—but Phantasma Gloria is a singular marvel. 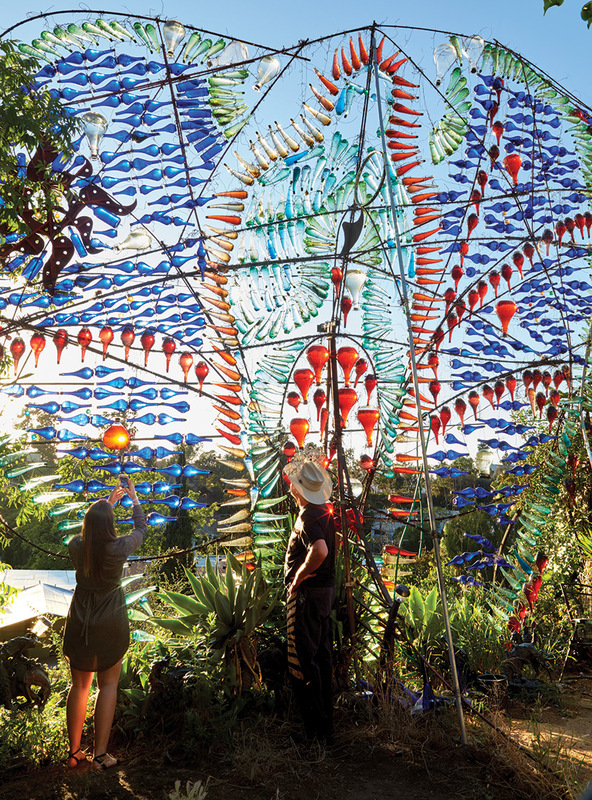 More than 1,000 teardrop-shaped glass vessels in shades of ruby red, cobalt blue, and aquamarine dangle from a 50-foot-wide, 35-foot-high web of rebar like a tapestry woven from oversize jewels. The containers—some from Trader Joe’s, some from Ikea, some from Spain and Poland—are filled with tinted water to refract the sunlight. As you gaze at the mosaic of lenses, a figure of the Virgin of Guadalupe emerges. The effect is magnificent. Appropriately enough, the first Phantasma Gloria (it’s been through 23 iterations) came to Lawrence as a vision. It was 2000, and the set designer, now 60, was looking out his kitchen window as he washed the dishes. The San Gabriels stood in the distance, a bank of cumulus clouds roiling above while palm trees swayed on a knoll. Then he caught sight of a glass vase on the windowsill. Sunlight had turned the vase into a convex lens, and the same scene was refracted in finely wrought detail, only upside down. “It was the most incredible gem I’d ever seen,” Lawrence says. And so his life’s work was born; 17 years later he’s working to add an angel to the display. Passersby can see it plainly from the street, but Lawrence gleefully welcomes visitors between 9 a.m. and dusk on Sundays or by appointment.